By giving Vincent “Pete Campbell” Kartheiser the KFC account earlier this year, Yum! Brands began the process of revamping its fast-chicken operation to appeal to all the cool chicks out there in radio-and-two-piece-meal land. Kartheiser now embodies the “heartthrob Nashville Hot Colonel,” who differs from the Norm Macdonald/Darrell Hammond/Rob Riggle/George Hamilton culinary commanders by being younger and more blue-eyed. But he’s also been relegated to a non-speaking role, appearing on album covers in commercials where a bespectacled father and daughter argue over her newfound love of the hottest of KFC’s 11 herbs and spices. 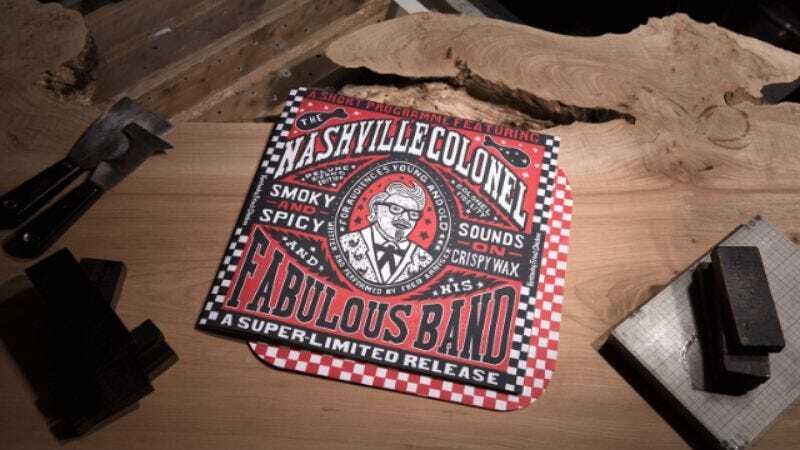 Well, KFC has finally provided a voice to the new colonel, and it’s Fred Armisen’s. The Saturday Night Live alum and Portlandia star has written two new jingles for KFC, including one that provides a crash course on Nashville. Armisen’s bluesy riffs will also be made available in vinyl form, on an album titled A Short Programme Featuring The Nashville Colonel. According to KFC’s website, a free 12-inch will be distributed at select record stores. A tremendously limited-edition lathe-cut vinyl record has been hidden in select record stores across these fine United States. Could you be one of the lucky guys or gals who gets to add this special album to their audio library? View the map below and be the envy of everyone in the world who does not have this magnificent record.